This is a garden show stopper. 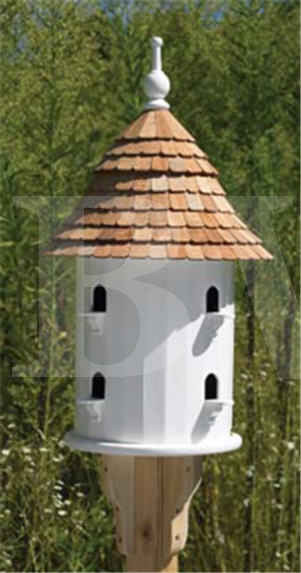 This adaptation of an English dovecote makes an excellent focal point in the garden. It is divided into 8 separate compartments and is available in white. This classic design birdhouse has hand placed cedar shingling, topped by a matching finial. It is divided into eight separate bird habitat compartments and is available in classic white. 16 inches in diameter x 28 inches high with 1.5 inch entry openings, it is perfect for a majority of the smaller backyard birds of North America including finches, wrens, nuthatches, chickadees and bluebirds. The timeless beauty of this house will bring years of enjoyment to your backyard habitat. Hand constructed in a quaint craft shop in rural Maine, this piece will serve as a daily reminder of the quality and care that goes into building each of these houses. Perfect gift for those discerning individuals on your list that demand and appreciate the finest. Treat yourself to an indulgence in high end, old world, country elegance with this wondrous home. All Lazy Hill birdhouses are now made of a solid cellular vinyl. Please allow 7 to 10 days for delivery, these are hand crafted.